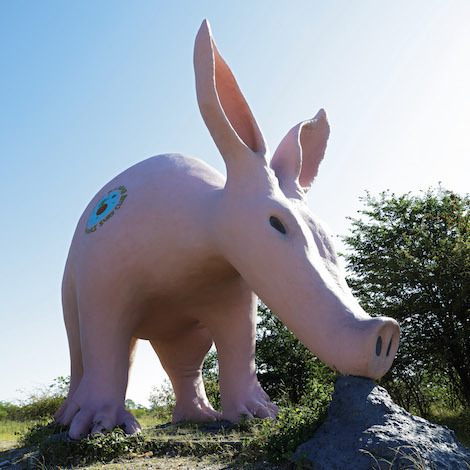 Follow the road pointed out by the giant anteater and you'll discover the intriguingly named Planet Baobab... 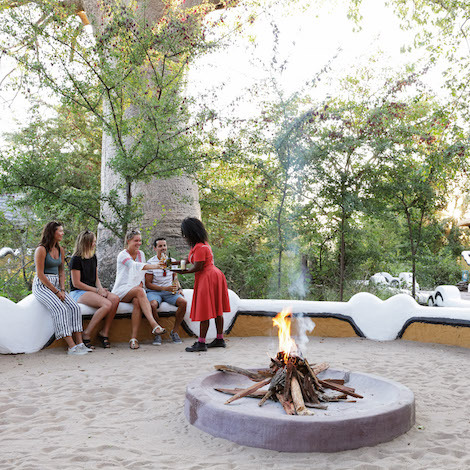 This is the Baobab Capital of the World, where the average age of each tree is more than 4000 years, and the boundless lunar landscape of the Makgadikgadi Salt Pans are the size of Switzerland. How's that for awe-inspiring? 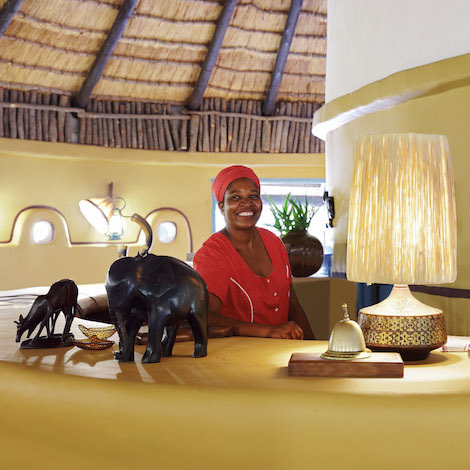 This is a quirky place in a quirky part of the world, where we live cheek to tusk with old elephants; sleep in Afro-chic Bakalanga Huts; swim in the largest, coolest pool in the Kalahari; eat the finest pan-African cuisine, and of course, drink something cold with hunters and vagabonds, travellers and locals in the funkiest bar in Africa. 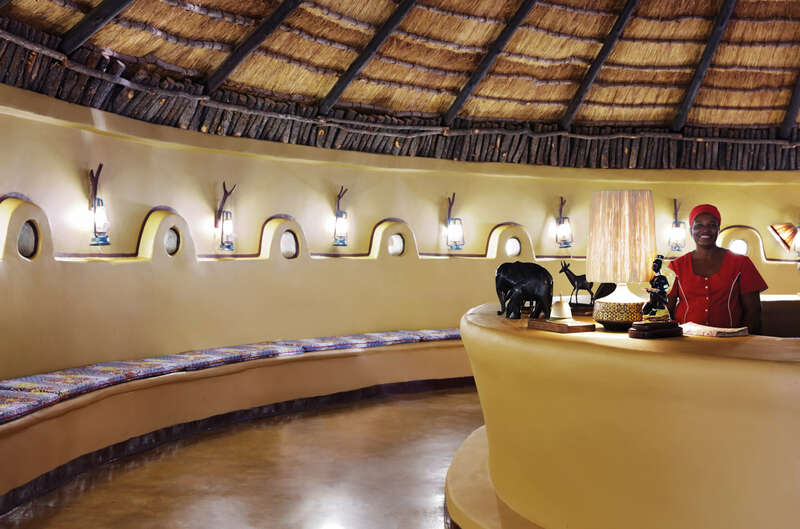 It's the coolest desert oasis around – and a part of Africa that few will experience, but all will remember. 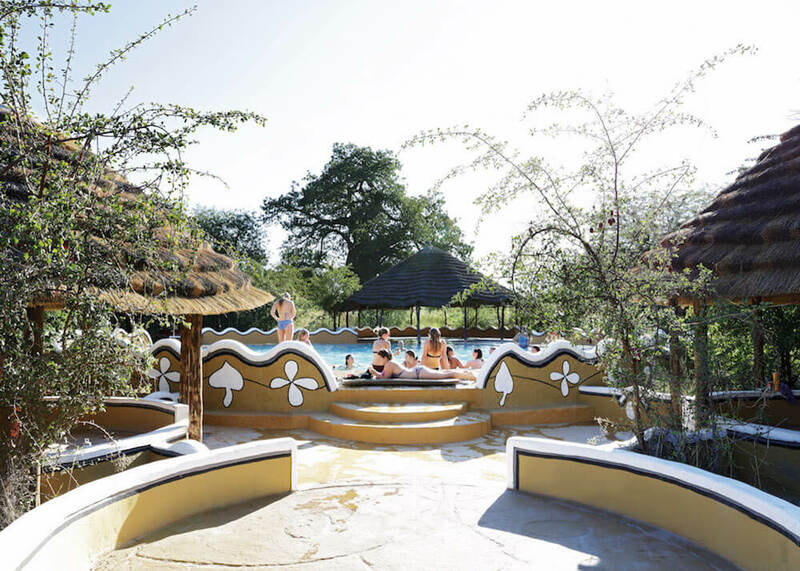 There are several different options and packages that can be booked at Planet Baobab - please contact us for more details. 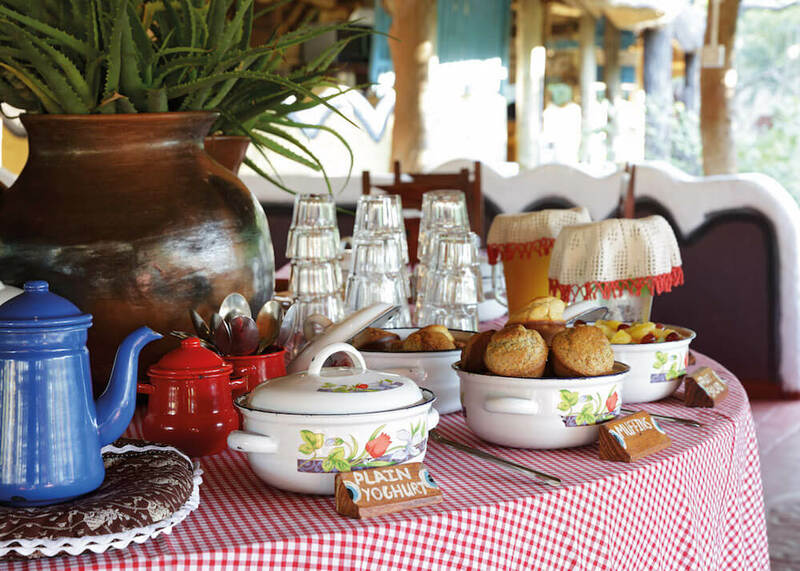 Please note that we cannot pre-book dinners or lunches on our B&B options. On all packages, flights, premium brand beverages, tips and gratuities, items of a personal nature, and travel insurance are excluded. 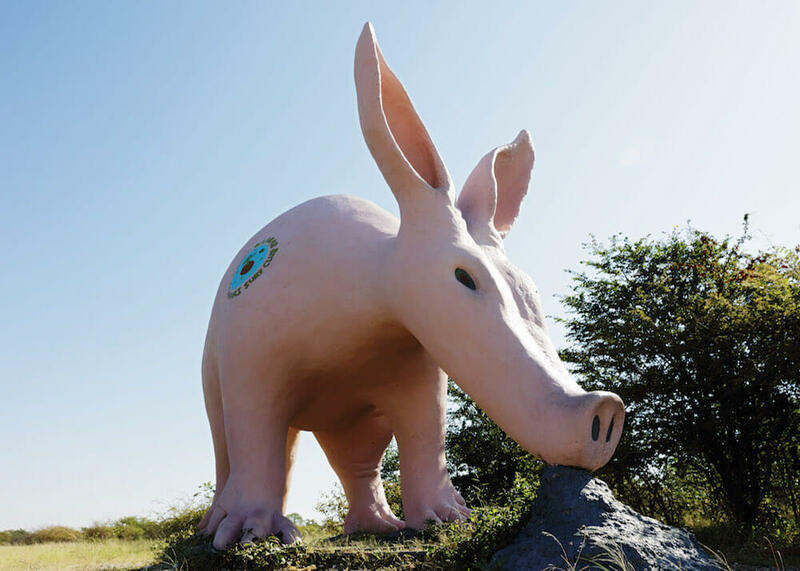 Planet Baobab is accessible by two-wheel drive; look out for the giant aardvark 200 kilometres from Maun and 100 kilometres from Nata. 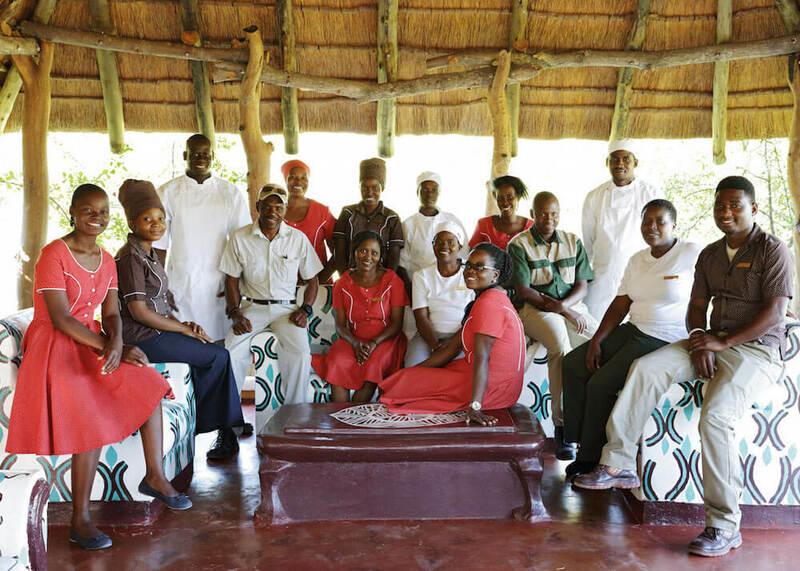 You can also fly from Maun to Gweta, and road transfers to the camp are available from both towns. Game drive in the Ntwetwe Pan and discover the unique, desert-adapted species that inhabit the lunar-like landscape. 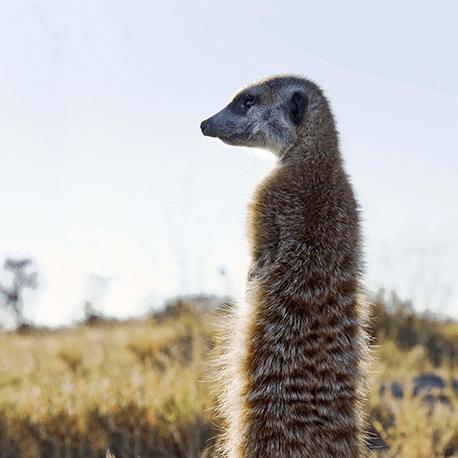 Get up close and personal with the coolest residents of the desert, the Kalahari meerkats. 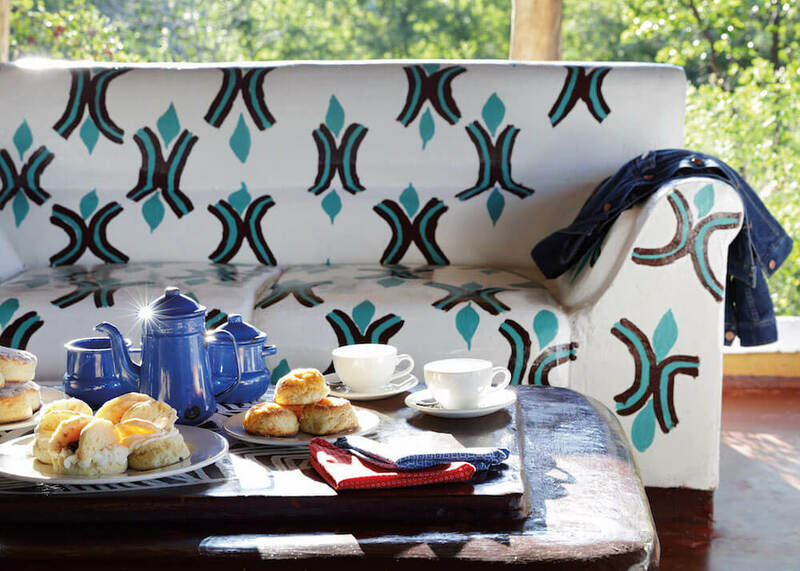 Visit the local village, learn about the local Batswana culture and munch on a traditional lunch. Join a Baobab Bushwalk and amble through the spindly forests with a knowledgeable guide by your side. 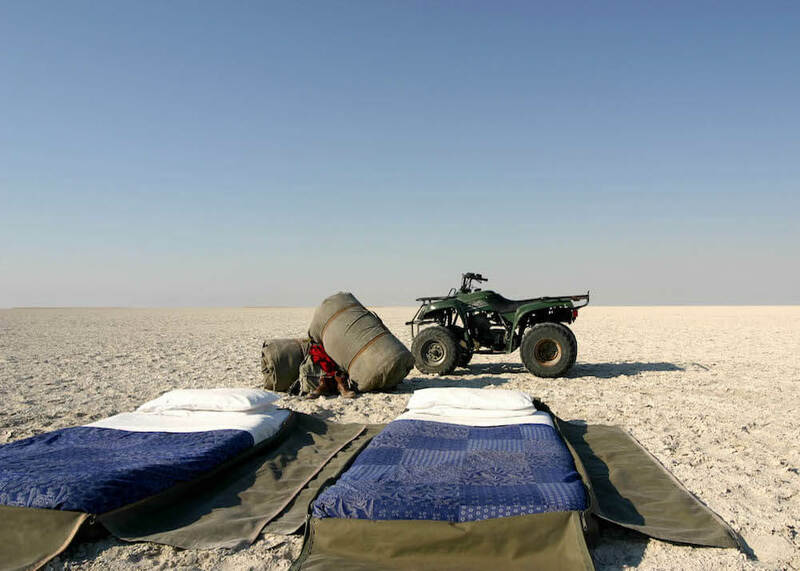 Rev your engine and quad bike across the never-ending pans (2 guests per quad bike), before sleeping out under the stars in a magical fly camp. 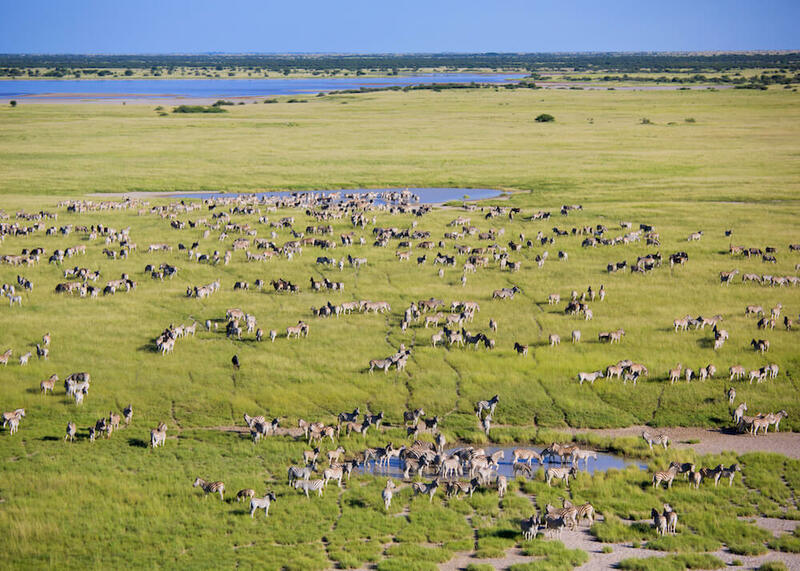 All of our camps surrounding the Makgadikgadi Pans National Park support the Makgadikgadi-Nxai Pans Conservation Initiative, a project aimed at creating optimal conditions for the mammal migration through the area. 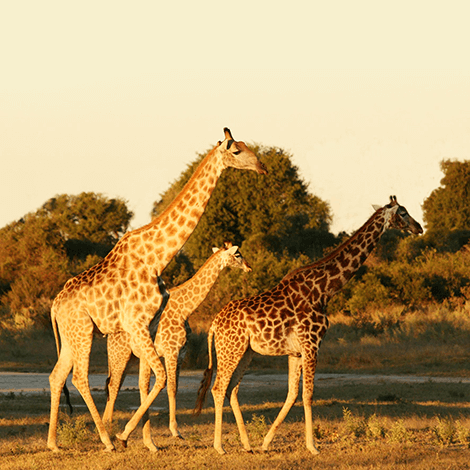 What is believed to have been Africa's greatest large mammal migration used to occur here and, over the last decade, we've seen its gradual return. But since the migration last occurred (pre-1960), the landscape has changed considerably. This has led to land use incompatibilities primarily due to livestock and fencing, and the safe passage of the migration is not guaranteed. 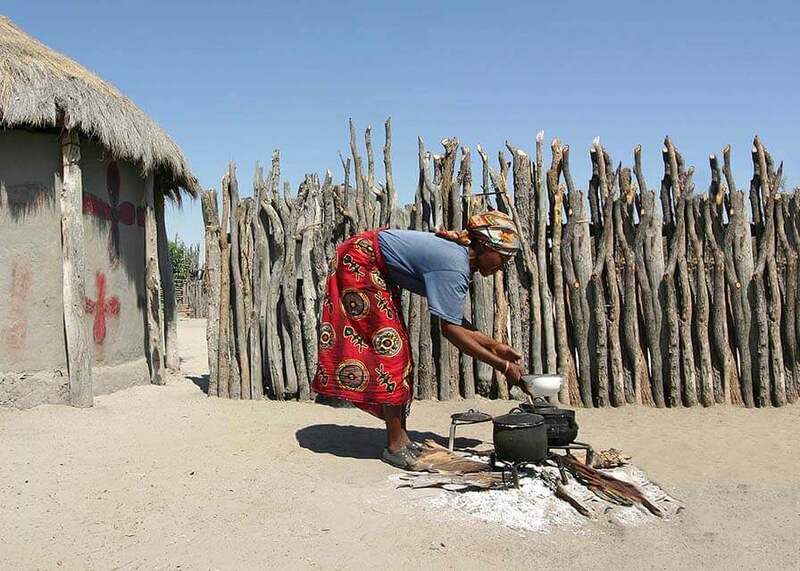 The Makgadikgadi-Nxai Pans Conservation Initiative therefore aims to address human-wildlife conflict around the park through community-informed land use planning and the introduction of sustainable economic incentives for wildlife-friendly land use practices. 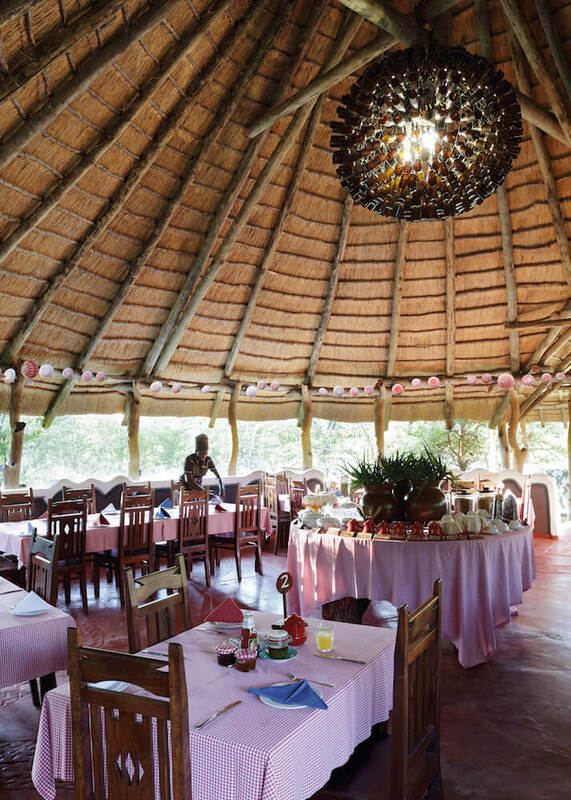 Planet Baobab is open all year round. The dry, winter season is from 25 April to 31October, and this is when the pans are in their most iconic state. 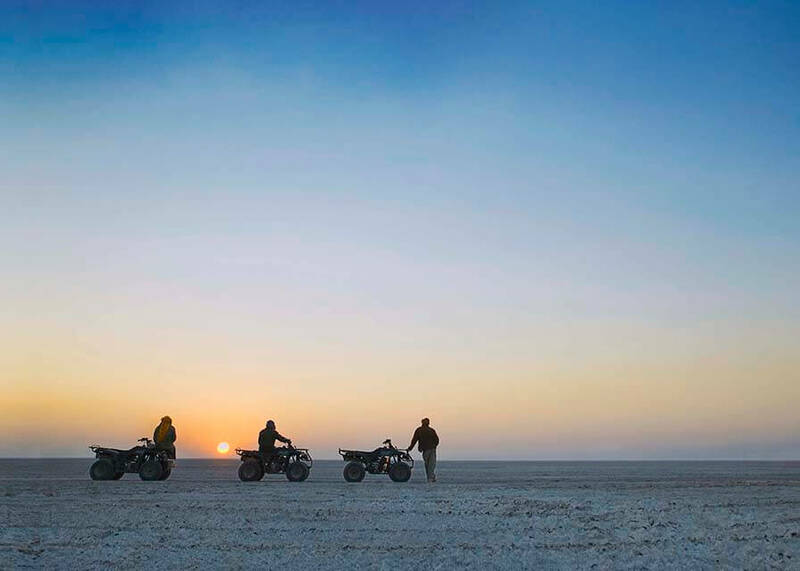 Sun-scorched, shimmering salt stretches as far as the eye can see (and a little bit further), and days are spent walking across the desert with local guides, roaring into the horizon atop a quad bike, and sleeping under a billion stars in the middle of, well... nowhere. In the summer green season, the pans are almost unrecognisable. After a torrent of much-needed rain, the iconic desert landscape explodes into life in a patchwork of glossy green vegetation. 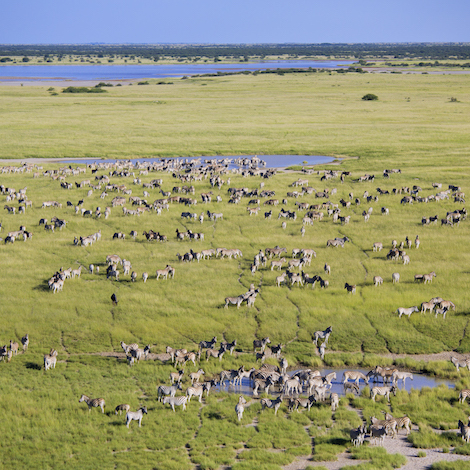 Animals come to graze, birds flock, and of course, the zebra migration, the second largest migration of mammals in the world, passes through to munch on the newly-sprouted grass. Combined with the stormy skies and dust-free air, the spectacle is a photographer's (and wildlife-lover's!) dream. Please note that all activities are weather-dependent and cannot be guaranteed. Surrounding Planet Baobab is a world of endless horizons, four-thousand-year-old inverted trees, bikes with four wheels, and little friends that live in holes in the ground. 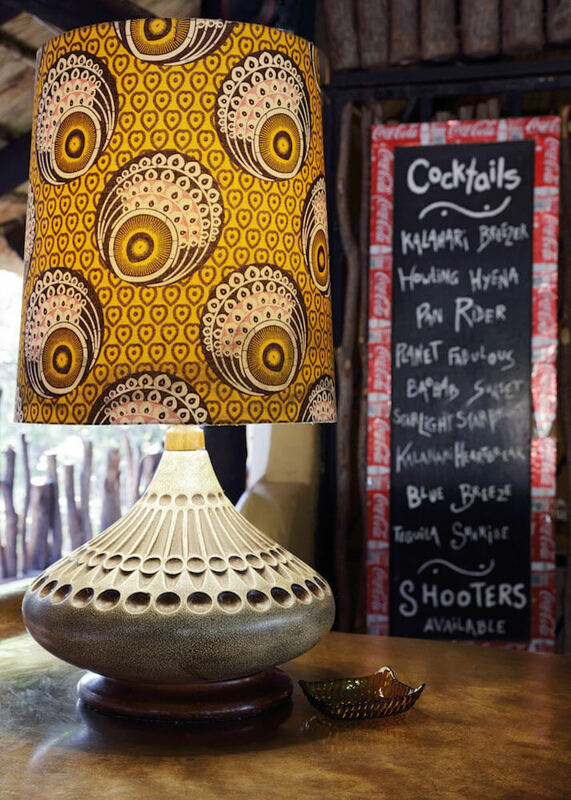 Sounds quirky and a little bit funky? 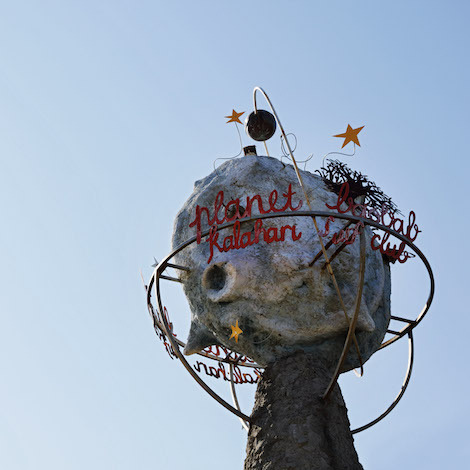 Well, that's exactly what Planet Baobab is. In fact, it's probably the most unique camp on the continent, in one of the most unique areas. 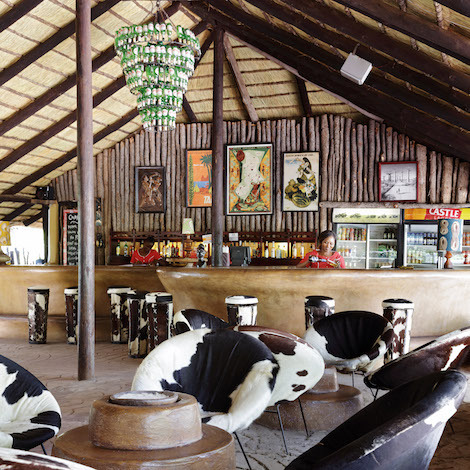 Planet Baobab is open all year round. 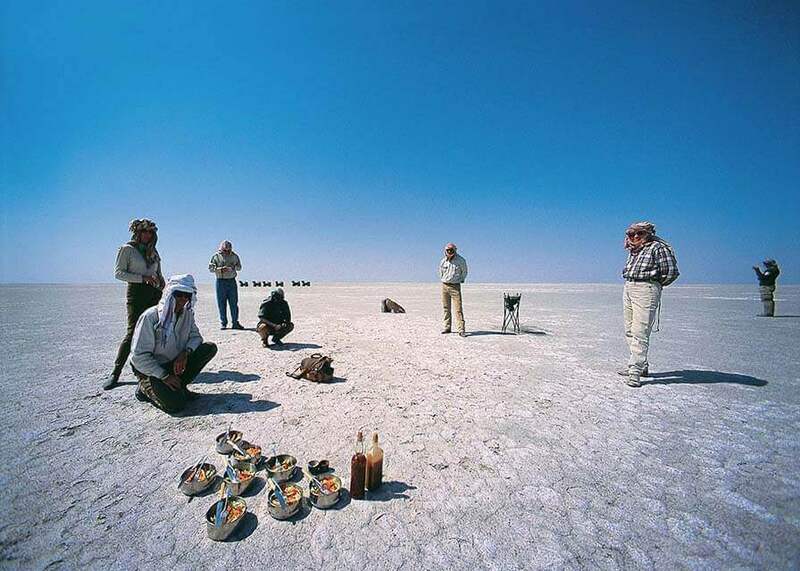 The dry, winter season is from 25 April to 31 October, and this is when the pans are in their most iconic state. 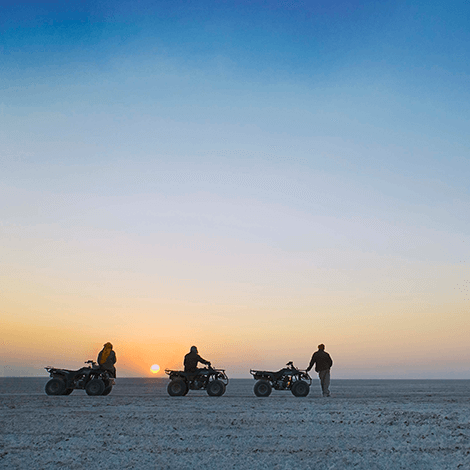 Sun-scorched, shimmering salt stretches as far as the eye can see (and a little bit further), and days are spent walking across the desert with local guides, roaring into the horizon atop a quad bike, and sleeping under a billion stars in the middle of, well... nowhere. 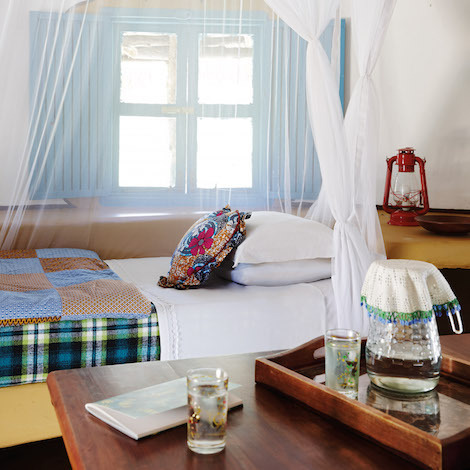 Our rooms are quirky, cool and super comfy. 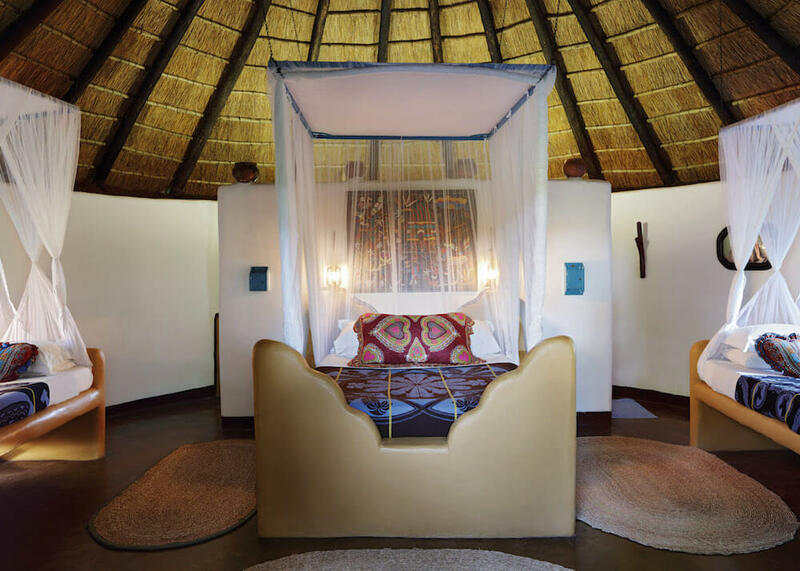 Scattered beneath a fraternity of colossal baobabs, the 18 thatched huts (eight Bakalanga, seven Baobab and three Bakalanga Family) take more than a little inspiration from the local Botswana villages, and all are arranged in friendly clusters. 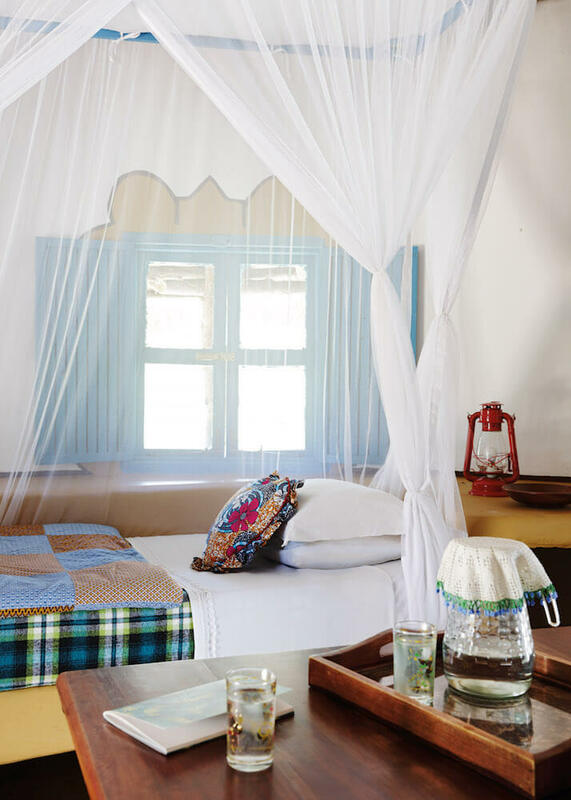 Vibrant murals adorn the outside walls and inside, you'll find sunny patchwork quilts and a variety of eclectic trinkets that won't fail to make you smile. 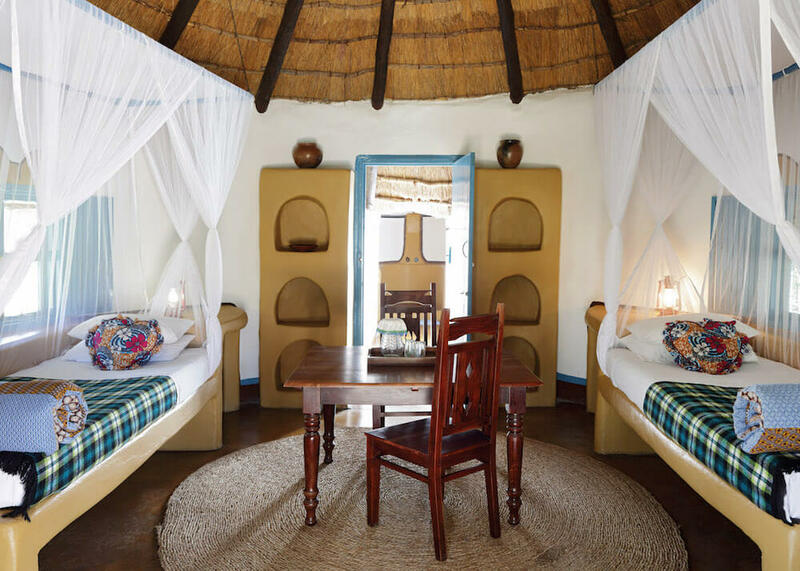 Twin huts have two beds on either side of the room, family huts have a large double bed in the centre with twin beds on either side, and all have ensuite bathrooms. 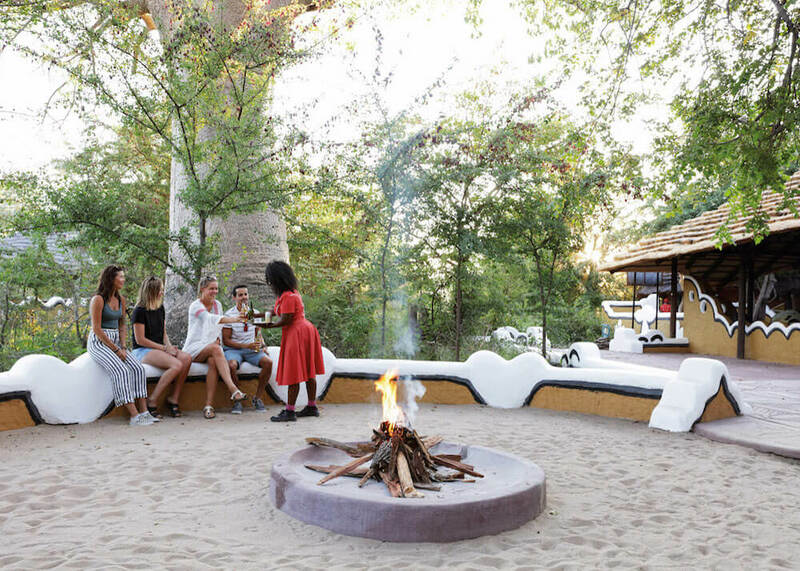 If you're taking things a little easier on the pocket there's also a selection of camping spaces with shared bathroom facilities, and a shady campsite with the best ablutions in Botswana, fact! 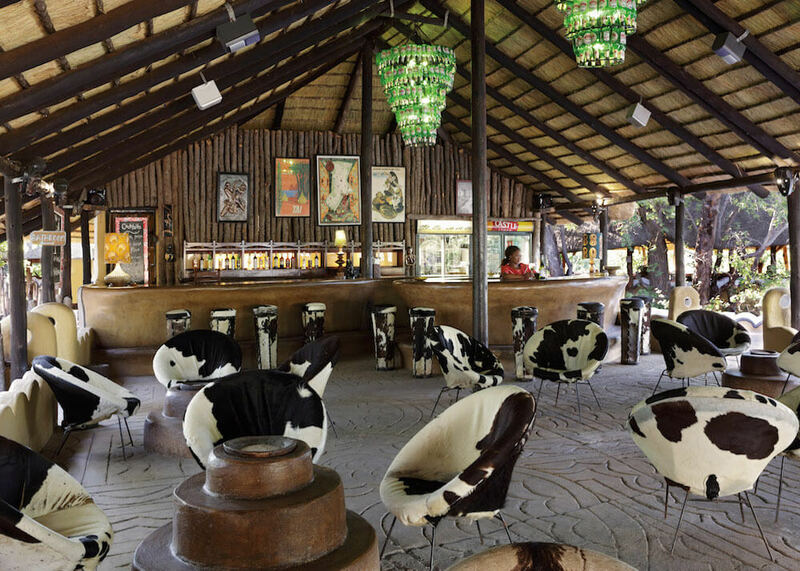 An enormous bar area, adorned with wine-bottle chandeliers and cow-hide chairs, is at the heart of the camp. 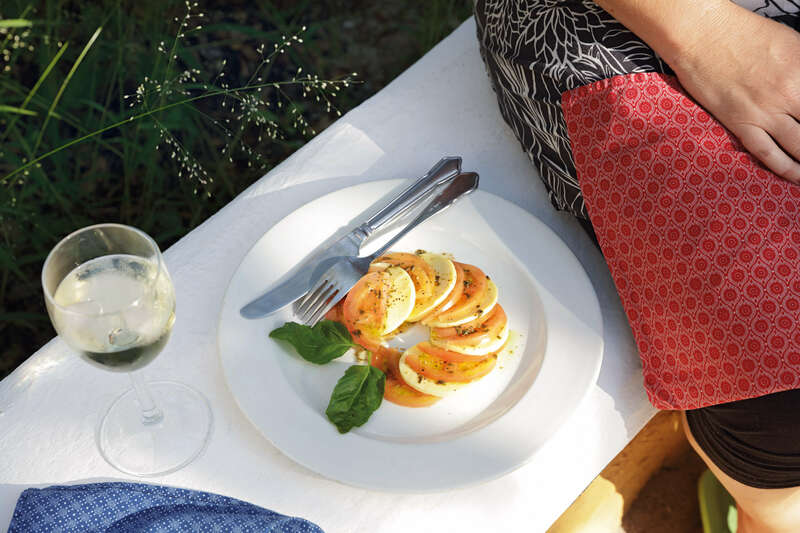 There's an a la carte menu to tickle your taste buds, and an even larger drinks menu to satisfy your parched throat after a day in the desert – and plenty of interesting characters to share them with. 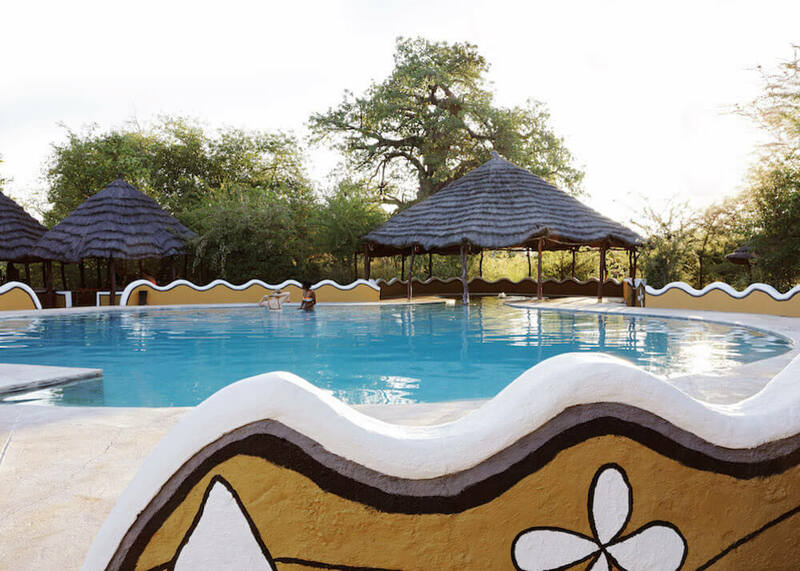 Outside, the largest, coolest swimming pool in the Kalahari glitters tantalisingly, as do the shady sun-loungers and braai areas. 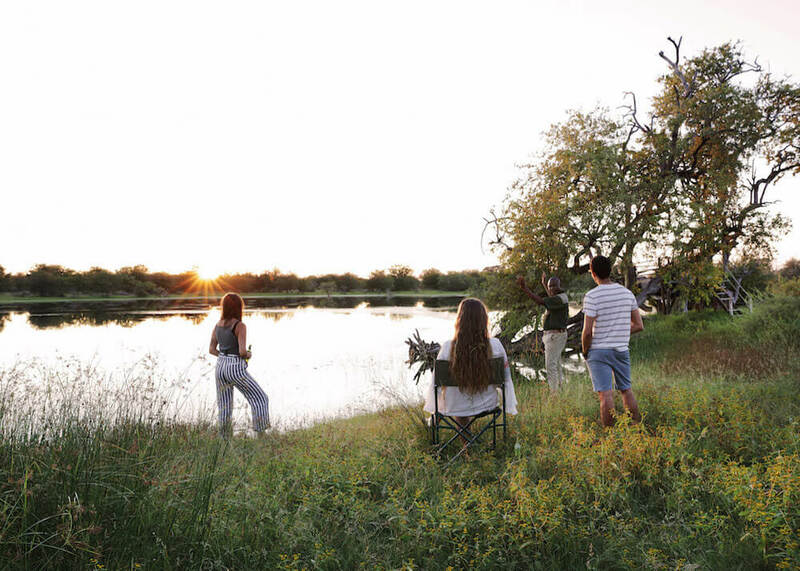 Game drives from Planet Baobab will take you deep into the Ntwetwe Pan, the larger of the two Makgadikgadi Pans, and a vast expanse of sparkling salt that extends as far as the eye can see – and a little bit further! 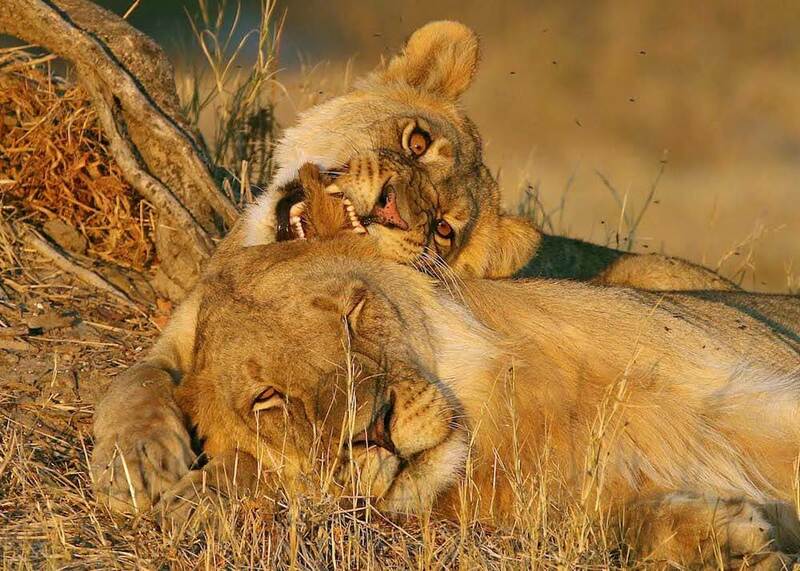 Remarkably, there is life to be found here and game drives will reveal some of the uniquely adapted desert species such as bat-eared foxes, springbok, kori bustards, and perhaps even the magnificent desert-adapted elephant and lion if Lady Luck is on your side. The arrival of the summer rains in December heralds the arrival of the zebra and wildebeest in the second largest migration of mammals on the continent, and life becomes frenetic as the hooved beasties feed on the fresh, green grass – and the predators have plenty to eat. 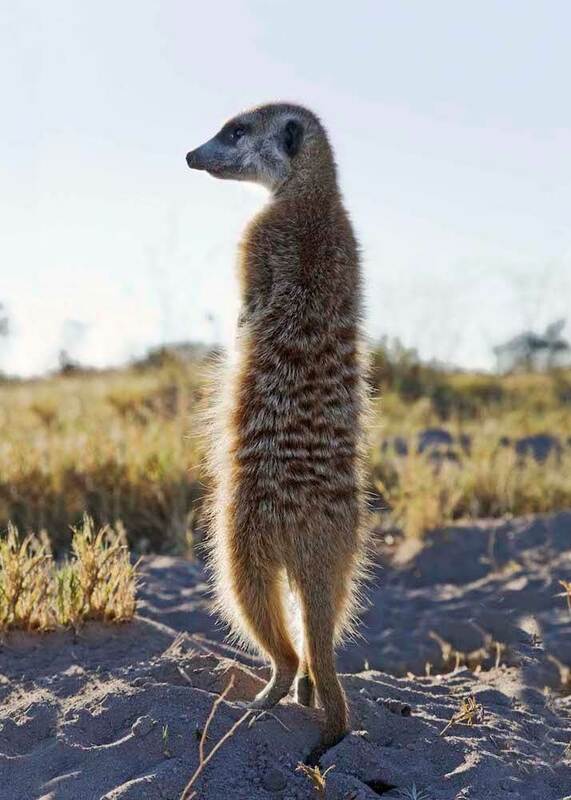 And then, of course, there's our resident Kalahari cool cats of Ntwetwe– the meerkats. Completely habituated to human presence through years of research, you'll get closer than you might think to the cheeky creatures! But just remember, they’re not tame – just used to our non-threatening presence. 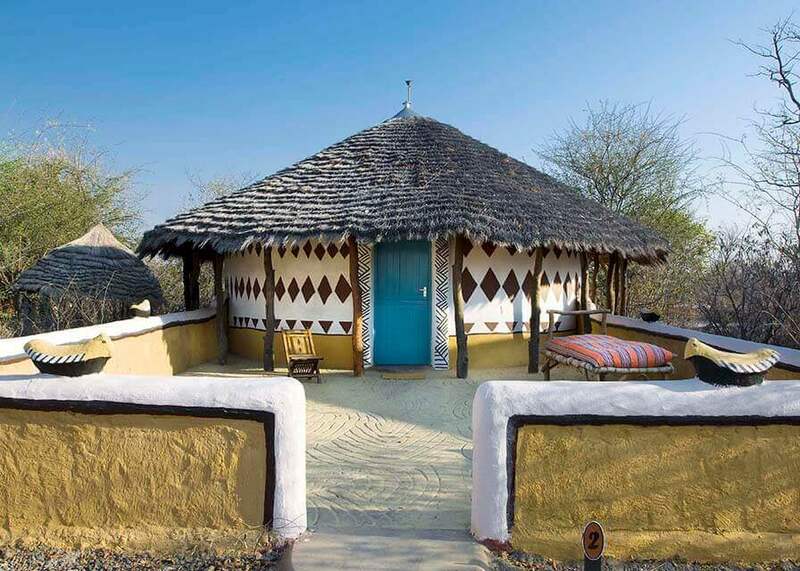 Planet Baobab is in the region of Botswanas mysterious Makgadikgadi Pans, an area bigger than Switzerland, which was once the largest expanse of fresh water on the planet. Today, it's a vast, salt-pan desert of shimmering sand and surreal landscapes so vast you can see the curvature of the earth. It's a harsh and sparse landscape, but one that's beautiful in its desolation. Here, perhaps more than anywhere else in the world, you'll be struck by a feeling of utter, marvellous, isolation.